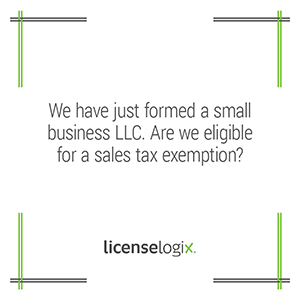 Is a small business LLC eligible for a sales tax exemption? Generally, sales tax exemptions apply to resellers of goods, non-profit organizations, and the sale of specific goods listed by the state. Often you will have to first apply for a sales tax permit in order to obtain a tax exemption. In some states there is an additional registration process to obtain a tax exemption and in some states there is no registration required. For additional help you can click contact us, or give us a call at (800) 292-0909.